Readers of my blog are likely well aware that when it comes to Health Canada and nutrition I've got low expectations. That said, not even my lowered expectations were enough to prepare me for the mind-numbingly stupid new nutritional education campaign unveiled last Friday at a Longo's supermarket in Toronto. The campaign had fanfare with a formal press release from Health Canada touting a, "Major Nutrition Labelling Initiative", replete with an important feeling press embargo and a razzle dazzle press conference with our own Minister of Health. Multiple reporters contacted me prior to the event asking if I knew what was up, and a few opined that it was odd that Health Canada hadn't provided them with much pre-information. Of course it was only after the press conference that we all understood why they weren't given much - there wasn't anything to provide. If a product has less than 5% of its percent daily value of whatever, that's a little. 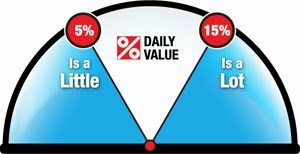 If a product has greater than 15% of its percent daily value of whatever, that's a lot. That's it, that's all, see you later folks. Oh, and they've also got a shiny new website that tells you pretty much the same thing. Canadians don't know a heck of a lot about nutrition and Health Canada's recommendation that you "use" the percent daily values to guide choices assumes far too much. For example, let's say you're trying to compare two pretty much identical products that differ only in Vitamin A and Vitamin C levels - should you choose the one with more Vitamin A or the one with more Vitamin C? I don't know the answer, so why should you? Here's another. What matters more? High levels of fibre and iron or low levels of sodium and saturated fat? You know what's the very first number on our nutrition facts panel? Calories. You know what this latest campaign, rolled out explicitly with obesity as part of its rationale avoids teaching about? Calories. How difficult would it have been for Health Canada to on their percent daily value page include a calculator to help determine a person's caloric needs and then instruct them on how to use that number to navigate nutrition fact panel calories? Ultimately what Health Canada has done is to decline to actually affect a useful nutrition facts panel reform - one which would have done such things as eliminate the arbitrary, non-real world servings sizes, disallow the use of multiple sugar synonyms to make products appear as if sugar's only a minor ingredient, get rid of those micronutrient levels that no Canadians, not even nutrition professionals, really know how to utilize and serve only to confuse (really, do we have so much scurvy and night blindness that we actually need to list Vitamins C & A? ), and instead they came up with a lame dog and pony show promoting mindless nutritionism and the dangerous notion that eating, "healthy" somehow protects weight. I guess I've got to reset my Health Canada nutrition bar lower. Sadly, I think that'll now mean digging.